The Ministry of Overseas Military Forces of Canada, established in October 1916, controlled the organization, supply, and maintenance of all Canadian forces overseas, including the Canadian Corps and the overall Canadian Expeditionary Forces. The new ministry, created to replace an ineffective maze of overlapping authorities and organizations that had hampered military administration in the first two years of war, was a cabinet post headed first by Sir George Perley (from 31 October 1916 to 11 October 1917), and then by Sir Edward Kemp until the ministry’s dissolution in July 1920. Before its establishment, few officials in London understood how Canadian forces were being led and administered; afterwards, there was a clear authority in charge. 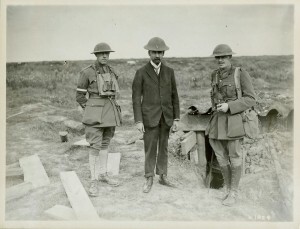 The Ministry’s creation was an important step in imposing Canadian authority over its overseas forces, and an example of Canada’s growing exertion of an independent voice in its own imperial affairs. 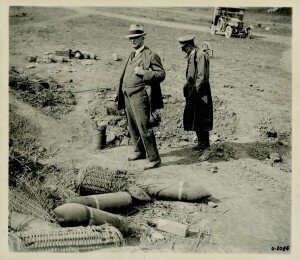 Sir Edward Kemp views a German ammunition dump at Amiens in August 1918. Kemp succeeded Sir George Perley as Minister of the Overseas Military Forces of Canada on 12 October 1917, and held the position until 1 July 1920.